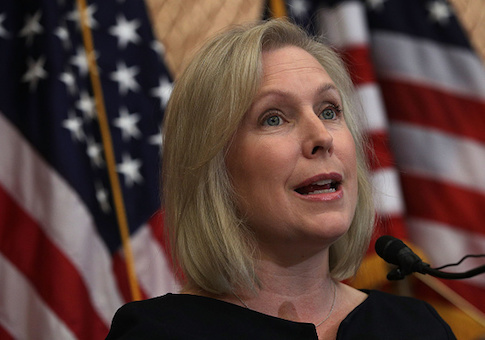 Gillibrand told The Post-Star she took the view that the agency needs to be reimagined after receiving a letter from ICE agents. "Local law enforcement will not work with them. Local elected officials aren’t working with them," she said. ICE, which was created in 2003 as part of the Department of Homeland Security, is tasked with enforcing "federal laws governing border control, customs, trade and immigration to promote homeland security and public safety," according to the agency's website. Other Democratic lawmakers have also called for ICE to be abolished, including Sen. Elizabeth Warren (Mass. ), who said ICE needs to be replaced "with something that reflects our morality and that works." New York Democratic gubernatorial candidate Cynthia Nixon referred to agency as a "terrorist organization" with President Donald Trump as its "egomaniacal leader." Democratic congressional candidate Alexandria Ocasio-Cortez said ICE’s structure is "as undemocratic and authoritarian as it gets in the US." Multiple surveys have shown a lack of support for abolishing ICE. A July poll by Politico and Morning Consult showed only 25 percent of voters favored abolishing the agency while a majority preferred keeping it. Last month, an Associated Press survey found only a quarter of Democrats supported abolishing ICE. This entry was posted in Politics and tagged ICE, Kirsten Gillibrand. Bookmark the permalink.